Hialeah, FL – Boca Raton FC faced their most crucial match of the 2015 American Premier Soccer League season on Saturday when they took on league-leaders, Red Force FC. Boca Raton FC got in the scoring side 13 minutes into the game when Gabe Taboda blasted a shot that deflected off a Red Force defender and found its way to the back of the net to give the visiting team the early 1-0 lead. Both teams were evenly matched throughout the game and right before the halftime whistle Sekani Sinclair doubled Boca Raton FC’s lead heading in the break. Red Force took one goal back in the 56th minute. The second half was a chippy one, seeing a total of 11 yellow cards, and Shadi Harb being sent off after receiving his second yellow fo the game. Boca Raton added some cushion to its lead in the 64th minute when Gio DiMauro scored giving the visiting team the 3-1 lead. The club took a charter bus with over 50 Boca Raton FC fans down to the game and their presence was felt. Boca Raton FC now sit atop the APSL standing in their inaugural season with one more road game. With the win, Boca solidified their first-week playoff BYE week as being one of the two top seeds and will host the winner of the quarterfinals game at The Shipyard on Friday, July 24. More information on tickets will be released at a later date so make sure to check back on Boca FC’s facebook and twitter pages for more information. 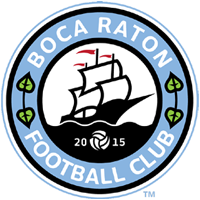 ◂ Hit The Road With Boca Raton FC!